Runoff generation and its transmission to the outlet from an ungaged river basin having an identifiable channel network are considered at the basin scale. 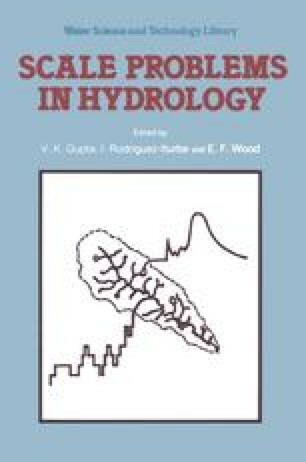 This scale is much larger than the hydrodynamic scale, where the equations governing the transport of water overland and in saturated and unsaturated soils are best understood. Gravity, via altitude, plays the fundamental role in both the transport of water as well as in network formation via erosion and sediment transport. So, here altitude is identified as the natural parameter for physically rigorous descriptions of network structures in the context of hydrologic investigations at the basin scale. In this connection an empirical postulate is made on the link heights as being independent but possibly non-homogeneous random variables having an exponential distribution. Data from six river basins ranging in sizes from 1 sq. km to 100 sq. km and from different climatic regions are used to test the suitability of this postulate. The drainage scaling parameter D N is introduced as the number of links per unit area density in an infinitesimal increment of the altitude at the basin scale. Data from five of the six basins is analyzed to show qualitatively that these basins are homogeneous with respect to D N . This homogeneity along with that in the exponential nature of the link heights are used to illustrate that the total runoff generated by the sub-basin associated with any link of a basin, has a gamma distribution with parameters λ/\( \overline \mu \) and 2 (link magnitude) - 1., The parameters denoting the link magnitude, the mean link height λ-1, and the long time average volume of runoff per unit elevation of a link, \( \overline \mu \), are meaningful only at the basin scale.